The Nikon D810 became yet another in a string of FX cameras that Nikon has had to fix shortly after shipping. This time it was white dots in frames shot with long exposures or with the 1.2x crop option active. The second wave of shipments from Thailand appear to have the fix already present (firmware L1.01 is one indicator, as well as a black dot in the tripod socket). As often happens, I disappeared off into the field (Africa this time) with a two-week old camera only to find out about the issue when I returned home (though see below). But the real problem I have with the white dots issue isn’t timing, it’s internal QA. This isn’t the first time Nikon has had hot pixel issues with long exposures and crop settings (the last time was the D7000 in 2010). In theory, the first time you discover that you forgot to address something in firmware, your QA department should have added a test for that for future products and be actively looking for the problem. Doesn’t look like Nikon did that in this case. Of if they did, they discovered it after products had already been manufactured and shipped off to subsidiaries. I’m not overly bothered by the problem itself. It was relatively minor, doesn't actually affect a large number of users immediately, requires that you be doing something that you don’t do often, and can be easily fixed. What’s concerning is the notion that we’re getting a long, long string of products coming from Nikon that need service advisories or have problems that aren’t actually explicitly admitted (e.g., to my knowledge, NikonUSA has never dealt with the V3 EVF issues publicly, nor the V1 battery aging problem). “In late July I purchased a Nikon 810 from B&H. I then read about the "white dot" problem with long exposures. Since I want to photograph the Milky Way on the Serengeti, I had a problem. I called Nikon and after waiting 20 minutes on hold, I couldn't get any comfort I would get my camera back [before the trip]. Yes, I know I sound repetitive sometimes, but that last line is the real problem: it’s not just the repeated QA issues that keep hitting new Nikon products, but it’s the manner and distance that Nikon Customer Service has towards customers that’s continuing to build frictions for Nikon. It’s not surprising to me that this site’s exclusive advertiser responded immediately and to the point—that’s one of the reasons why I have them as an exclusive advertiser, as I can vouch for their service—but Nikon’s direct response is almost always less than the customer expects. 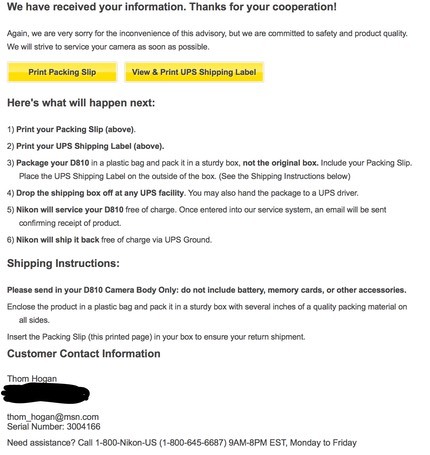 Worse still, NikonUSA’s lack of handling this person’s complaint directly and competently means that NikonUSA is now going to get a return from B&H of a defective camera, which will have to go in the refurbished bin, losing Nikon money in the process.